The Discoverer STT PRO is Cooper’s most advanced, extreme tire to date! The Discoverer STT PRO provides exceptional traction and performance in some of the harshest terrains on Earth. The distinctive tread design and compound provide remarkable on the road performance without sacrificing off-road traction. 3-Ply Armor-Tek3, silica tread compound, aggressive 3-2 center rib design, side-biters and more, all wrapped up in Cooper’s advanced mud terrain tire. Push the Discoverer STT PRO to the limits and you’ll “discover” what your vehicle is truly capable of! “ARMOR-TEK3®” Carcass Protection provides 50% more protection against impact damage than standard 2-ply tires. The inner tread ribs alternating 3-2 pattern provides a number of significant performance benefits like: reduced road noise, increased stability and handling, superior soft surface (trail) and mud traction. The “flex groove” provides a smoother ride by helping to dampen the impact generated by inconsistencies in pavement, potholes and gravel. 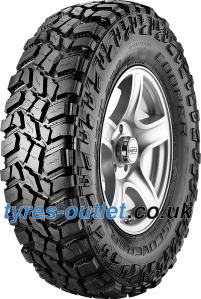 The Discoverer STT PRO features large, specially-designed cleats of rubber (side biters) on the shoulder area of the sidewall, to enhance traction and grip. The asymmetrical scallops on alternating lugs direct mud into the mud scoops to allow the tire to pull through muddy terrains with ease.